The primary varietal used in Tuscan oil production, the Frantoio olive tree is useful to the home gardener as well. This olive tree is self-fertile, meaning it doesn't require another variety to set fruit, but is also an excellent pollenizer to other olive trees. 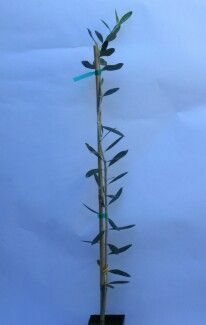 The Frantoio olive tree grows in semi-pendulous fashion, with dark green-gray leaves. The fruit also makes a good table olive after curing, with a slightly nutty flavor to the medium-sized fruit. As of October 2018 trees are about 1/4" caliper, pruned to 3' tall, no branching yet, in 4" x 6" pots.